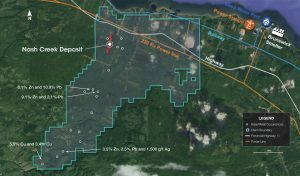 NEW BRUNSWICK – Callinex Mines of Vancouver has updated the resource numbers for its Nash Creek zinc-lead project near Belledune in the Bathurst Mining Camp. The newest estimate includes a major increase in contained metals, compared to the preliminary economic assessment completed in April 2018. Nash Creek is now thought to have an indicated resource of 13.6 million tonnes averaging 3.2% zinc equivalent (2.7% zinc, 0.6% lead and 179 g/t silver) for 963 million lb. of contained zinc equivalent. The inferred resource totals 5.9 million tonnes at 3.1% zinc equivalent (2.7% zinc, 0.5% lead and 14.0 g/t silver), containing 407 million lb. of zinc equivalent. The PEA covers both Nash Creek and Superjack projects that have open pit potential. The study put the post-tax internal rate of return at 25.2%. The net present value with an 8% discount was given as $128 million post tax over a 10-year mine life. Callinex believes that more exploration will improve the economics of the project. The company says a technical report for the PEA will be issued within 30 days. A two-minute video presentation of the Nash Creek project can be seen by clicking here.